I have two stories to report, one is good news about migration and the other is about a tragedy averted. The winds were perfect last night for a big migrant flight. The cold weather and north winds had frustrated many northbound migrants efforts to continue to their breeding grounds and they've been bottled up somewhere south of NYC. Last night an abrupt shift in winds and temperatures along the east coast had the effect of suddenly flooding Prospect Park with new birds. Doug and I were winding down the morning (he was heading out of town, I had an appointment) and rushing down to the south end of the park to check the Peninsula and Lookout Hill. As we entered the Lullwater path, just beyond the Nethermead Meadow, I noticed something small and brown hanging from a Locust tree, over the edge of the water. I thought, "Great, another bird caught in monofilament." Fisherman in the park frequently get their lines tangled in trees or shrubs and don't clean it up. I've posted a few stories about rescuing birds that get stuck in these unintentional traps, but what I saw this morning made me both angry and upset. 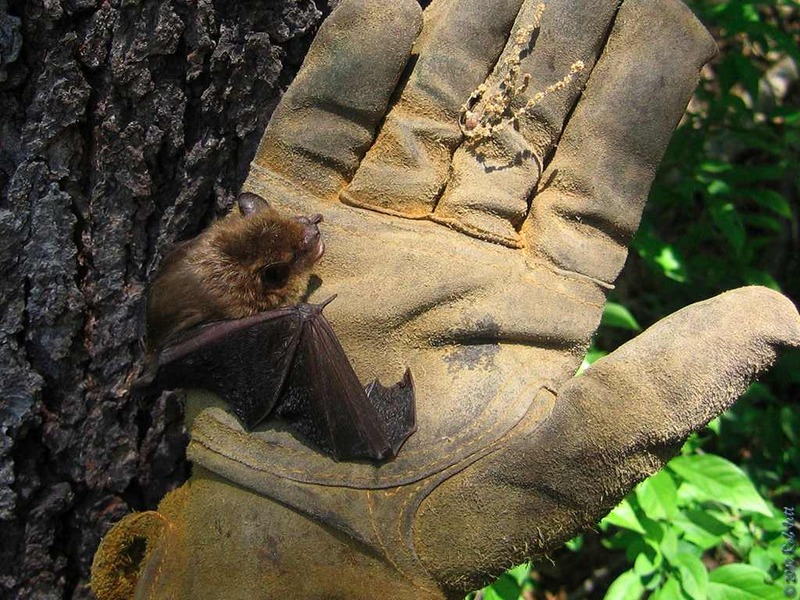 A length of fishing line with a small hook on the end was hanging from the tree with a Little Brown Bat snared by his thin, tail membrane. I walked down to the edge of the water to assess the situation. The bat was caught by a 2 foot length of fishing line tangled in a young tree about 15 feet above the ground. I thought that I might be able to bend the branch down, so climbed up in the tree as high as I could. Unless I gained about 75 pounds immediately, there was no way I would be able to bend the branch. Doug was in a hurry, so left me alone to figure out how to rescue the bat. I called wildlife rescuers Bobby and Cathy Horvath, but got their voicemail. Out of desperation I called the city's 311 line. After a 15 minute conversation where the operator filled out official forms for submission to the "proper agency", I realized that nobody was going to come to this animal's rescue. Several birders came by while I was in the Lullwater, but nobody had any useful suggestions. I rode over to the Nature Center in the Boathouse, hoping that someone there could help. The center was closed, but Jonathan was working and, when I told him about the bat, he said he'd be right over. 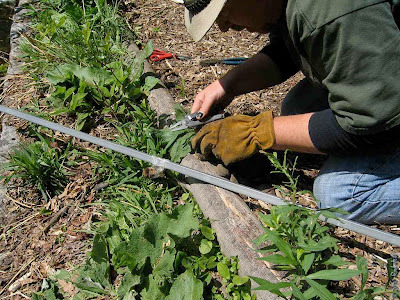 Jonathan came over with a telescoping pole, some gloves, wire cutters and miscellaneous tools. The pole was a little short, so we taped a section of aluminum molding to the end of it. 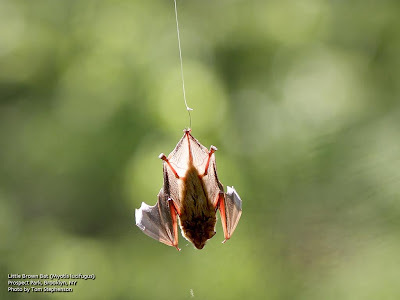 I thought that I might be able to release some of the monofilament from the branches, so the bat would be closer to the ground, and we could reach him. It was really awkward trying to position the 20 foot long pole without hitting the bat. At one point, I bumped the bat and he grabbed a hold of the pole, which made matters worse. I couldn't lower the pole because the section of fishing line that he was attached to was too short and would pull on the hook. It was around that time that I noticed Jonathan was yelling across the water to a couple of park workers in one of those small, eco-vehicles that you see around city parks. They turned out to be the veritable cavalry. Martin and Mark work for the Prospect Park Alliance's Natural Resources Crew. Martin is very experienced in wildlife rescue and their appearance wasn't a coincidence. Trish and Doug had seen them on Lookout Hill, told them about the trapped bat and sent them our way. As I stood at the edge of the water, holding a ridiculously long aluminum pole with a Little Brown Bat clutching on to it for dear life, these guys sprung into action. 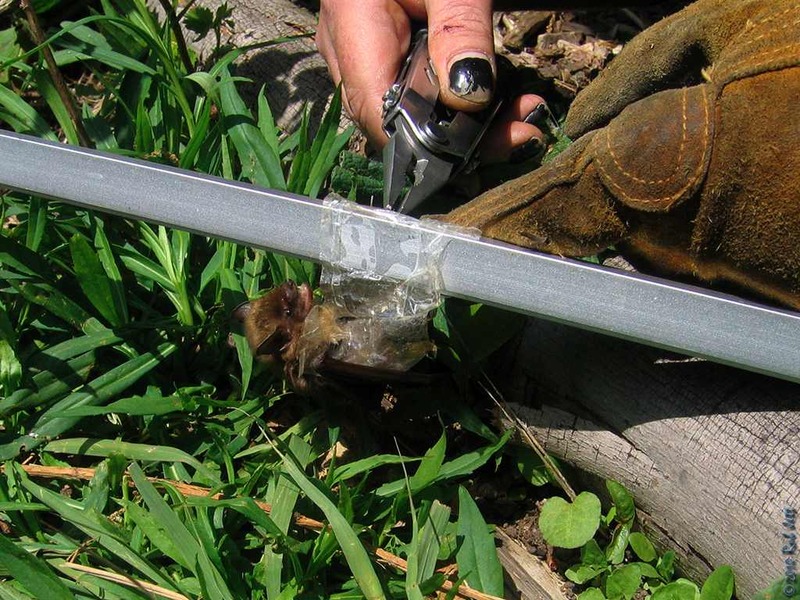 After Martin attached a rope to the tree's branch, Mark grabbed a bow saw and began slowly cutting into the branch. The plan was to cut partway into the branch, then lower it towards the water, while I guided the bat (now firmly holding onto the pole) towards the shore. It's great when a plan comes together, because after only a few minutes, we had the bat on the ground and Martin ready with his wire cutters to clip the barb off the fishing hook. Martin was having some trouble clipping the hook because the bat was trying to gnaw through it himself. I suggested holding him out of the way, so Martin had a clear shot at the barb. He gave me a leather glove so I wouldn't get bit. Little Brown Bats are a lot smaller up close than I expected. Its head was only about the size of the first joint on my thumb and it reminded me of a really cute field mouse. I held one wing to the side and kept his sharp teeth away from the clippers. After a few, tense minutes, Martin had removed the hook. Fortunately, the hook hadn't torn the bat's tail membrane and only left a small hole, which should heal quickly. I carried him over to a tree to allow him to climb to safety. At first, he didn't seem to want to leave my gloved hand, so Martin picked him up and placed him firmly against the bark. The Little Brown Bat quickly got the idea and scurried up the tree and out of sight. We may have saved only one, 12 gram animal, but they all matter. It's sometimes hard to see, but there are a lot people out there who really care about the welfare of wildlife, even in New York City. 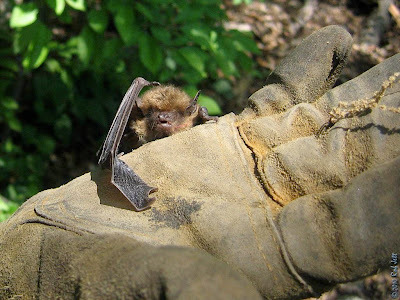 Without the help of the Audubon Nature Center, the Natural Resources Crew and a few thoughtful Brooklyn birders, the future of one Little Brown Bat would have been hopeless. This Black-crowned Night-Heron was found perched at the edge of Prospect Lake. Nesting in roosts on islands around New York Harbor, during the summer they can be frequently be seen flying into Prospect Park at dusk to hunt around the park's waterways. As the month of May approaches and images of a Spring songbird fallout flutter about in my head, I found myself in Prospect Park at dawn last Saturday and Sunday. Northbound migrants wait for south winds before taking off en masse for their annual breeding grounds. Friday night the winds were out of the North-Northwest, so I wasn't expecting to see much change in the migrant diversity and abundance around Prospect Park on Saturday. I suppose you could say that I wasn't disappointed. We did, however, manage to see a few first-of-year species. As I observed last weekend, the majority of the morning's bird activity was at the southern end of the park - along the south side of Prospect Lake, the Peninsula woods and on Lookout Hill's wooded sloops. Yellow-rumped Warbler was still the dominant warbler species, flitting about at the tops of, primarily, oak trees. Palm Warblers were seen in less abundance, bobbing their tails in the oak trees, as well. I meet Heydi at the south side of the lake just after sunrise. We heard a Northern Waterthrush singing then found it foraging along a muddy section at the edge of the lake. 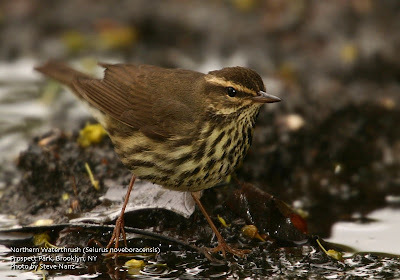 A Louisiana Waterthrush was found late in the morning at the opposite end of the park, in the Vale of Cashmere. Despite the "thrush" in their common names, these birds are actually wood-warblers, or New World warblers, and no relation to the thrush family. 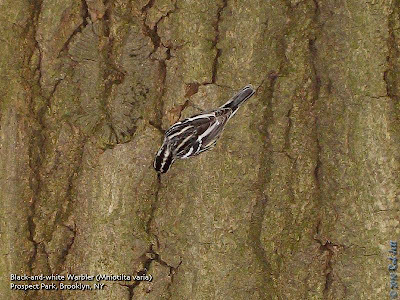 On the Peninsula, a squeaky wheel, "wee-see-wee-see-wee-see" drew our attention to my first Black-and-white Warbler of the season. A second one was heard much later in the Ravine. The buzzy "beer, beer, beer, BEEE" of a Black-throated Blue Warbler found singing near the Vale of Cashmere was the park's first of the season. Tiny, hyperactive Ruby-crowned Kinglets were heard singing from as low as shrubs to the tops of trees throughout the park. Two other first-of-year species for me on Saturday were Brown Thrasher on the south side of Prospect Lake and a small flock of Chimney Swifts feeding high above the lake. The thrasher was singing rhyming couplets from a perch above a section of burned out phragmites. I look forward to months of hearing the happy chittering sounds of swifts outside my kitchen window as I eat my breakfast. Except for one lonely Ruddy Duck, all of the overwintering waterfowl on the lake have departed. South winds were forecast for Saturday night, but so was lots or rain. I decided to go out into the park Sunday morning, despite the rain. Unfortunately, a fallout never materialized. In addition, it appeared that Saturday's birds either departed, expired or had more sense than me and stayed out of the rain. There was a short burst of yellow-rump activity on the Peninsula at around 7:30am, but that was about it. I checked the actually wind history when I returned home and found that the South wind had been very brief, then, through the course of the evening, switched from SE to ESE. By dawn the wind was coming from the East. Oh well, there's always next weekend. Sunday, May 2, 8 a.m.
Meet the amazing birds who use the Park as a migratory layover on this expert-guided walk. Start your Sunday morning surrounded by nature! Registration opens Monday 4/19. Public transportation. Meet 9am at the NYC Audubon office bldg. ( 71 West 23 Street, Manhattan) and travel by bus ( 1 hour) up to Sterling Forest Preserve, Tuxedo, NY. We'll hike about 3.5 miles around a lake and look for beautiful warblers including hooded, blue-winged, golden-winged, and cerulean. Bring lunch, binoculars. Leaders: Andrew Baksh, Don Riepe, John Yrizarry. Cost: $65. For reservations, call NYC Audubon (212) 691-7483. Become a part of the Museum’s very own Citizen-Science project studying dragonflies. Attend a walk, learn how to identify dragonflies, then get out on your own and submit your observations online! All walks and talks are FREE! Call Seth Wollney at (718)483-7105. This walk will focus on dragonflies that fly early in the season. We will be capturing dragonflies for a close up inspection. Meet in the main parking lot near the Parks Dept Field House. FREE monthly walks! Enjoy the beauty & ecology of Staten Island. Wear comfortable shoes, and bring binoculars if possible. To register and confirm meeting places call Seth Wollney at (718) 483-7105. Look for woodpeckers, waterfowl, raptors and much more. This presentation comprises a selection of photographs of natural history including birds. All the images were all taken by our members. This evening will be an opportunity for the audience to participate and the photographers to share their expertise and experiences. Sean Sime received a Masters in Photojournalism and Documentary Photography at the International Center for Photography in Manhattan. His photographs have appeared in Life magazine, The New York Times Sunday Magazine, Time magazine, and National Wildlife. The meeting is open to the public, without charge. Please join us for what promises to be a very exciting and fun evening. Enter the Museum at West 77th Street. If you would like to meet Sean prior to the talk, join us ay Pappardella's Restaurant, 75th Street and Columbus Avenue at 6 p.m. The reservation will be in the name of Alice. Thursday, April 29th, 6:30 P.M. The highlight of the spring migration no doubt are the warblers, small active colorful songbirds, known for their incredibly enchanting songs. With so many songs to remember, particularly with their musical variations, warblers present a challenging task for birders. Join us for a warbler song workshop presented by one of the best warbler song experts in the NYC area, Tom Stephenson. Note: as a follow-up, Tom will be leading the Prospect Park walk the Saturday after the workshop. Check the field trips page for more information. So Joe and I headed down to Turkey Point last night to try our luck for Yellow Rail again. We weren't super optimistic considering they hadn't been reported yet, but it was the only day I could steal away. < /embed> started calling as well. The sound of these three species was just about a constant the entire night. < /embed>, which was nice. After walking back to the car we decided to play a tape for Clapper Rail. No response. Yellow Rail..no response. We waited and walked a bit more. We did see two giant meteors blazing through the sky, but no birds. < /embed> were singing all around the marsh. We decided to catch a brief nap and get up when the moon set at 3:30am. As the three of you know I've never been a fan of "playing out" something to death, and thankfully this trip didn't push those boundaries. That said, there is absolutely no way we would have heard the Yellow Rail without attempting to play the recording. < /embed> on the way out and listened to it's whinny in between the chorus of [Whip-poor-wills]! Greetings. This is the New York Rare Bird Alert for Friday, April 23rd 2010 at 9pm. The highlights of today's tape are pelagic trip results, PROTHONOTARY WARBLER, AMERICAN GOLDEN-PLOVER, GLAUCOUS GULL and Spring migrants. With birding onshore picking up steam slowly a birding venture offshore certainly paid dividends Wednesday. Two birders took a private fishing boat out to the continental shelf, 70 plus miles south of Shinnecock Inlet, and encountered a [huge] Spring mix of birds in water temperatures ranging from 47F to 50F degrees. Near the shelf were 3 NORTHERN FULMARS, 4 early WILSON'S STORM-PETRELS and 4 molting RED PHALAROPES while closer in were an early SOOTY SHEARWATER, 2 adult LITTLE GULLS, a COMMON TERN and 57 RAZORBILLS and 4 ATLANTIC PUFFINS many of the alcids approaching breeding plumage. Over 70 NORTHERN GANNETS were also counted. Onshore the male PROTHONOTARY WARBLER was still being seen on Fuch's Pond in Northport at least through Sunday. Patience can be required to view this warbler which eventually returns to the wood strewn vegetation in the center of the pond. The pond is north of Route 25A adjacent to Waterside Road with an entrance on the east side of the road just before Seaside Court angles off to the right. Parking is available on turnouts off Seaside Court. The entrance is across the road from a house loaded with Wizard of Oz type paraphernalia in the yard. The New York State parks have been producing an increasing number of migrants. Some of the more notable visitors including a male HOODED WARBLER at Riverside Park in northern Manhattan Tuesday and a variety of warblers in Central Park featuring BLACK-THROATED GREEN WARBLER Sunday and COMMON YELLOWTHROAT and NORTHERN WATERTHRUSH Monday with Thursday adding BLUE-WINGED WARBLER, NORTHERN PARULA and PRAIRIE WARBLER plus now the rather widespread PINE WARBLER, PALM WARBLER, YELLOW-RUMPED WARBLER and BLACK-AND-WHITE WARBLERS and a WHITE-EYED VIREO. In Prospect Park an ORANGE-CROWNED WARBLER was seen Monday along with LOUISIANA WATERTHRUSH and BLUE-HEADED VIREO Sunday and Monday and a HOODED WARBLER appeared on Wednesday with 2 there Thursday and HOUSE WREN also arrived there Wednesday. Also in Prospect were 3 lingering RING-NECKED DUCKS Sunday and a BALD EAGLE over the lake Wednesday. Other distinct birds scattered about in local parks have been an UPLAND SANDPIPER at Calvert Vaux Park in Brooklyn Saturday, a GLAUCOUS GULL along with CLAPPER RAIL and 3 WILLETS at Plumb Beach in Brooklyn Monday, a lingering ORANGE-CROWNED WARBLER in Hempstead Lake State Park at least to Sunday. Four YELLOW WARBLERS at Jamaica Bay Wildlife Refuge Thursday, a YELLOW-CROWNED NIGHT-HERON at Cammann's Pond off Merrick Road in Merrick Sunday, a YELLOW-BILLED CUCKOO at Sands Point Preserve in Port Washington Sunday and a WHIP-POOR-WILL singing at Edgewood Preserve in Deer Park on Monday. Shorebird numbers were rather impressive at Tobay and Cedar Beach Marina last Sunday with thousands of birds, mostly DUNLIN, roosting along the shoreline at high tide. Other shorebirds at Cedar Beach Marina included a winter plumaged AMERICAN GOLDEN-PLOVER, at least 2 RED KNOT, 2 RUDDY TURNSTONES and a SHORT-BILLED DOWITCHER along with some BLACK-BELLIED PLOVERS and SANDERLINGS and a few GREATER YELLOWLEGS and AMERICAN OYSTERCATCHERS. Two more SHORT-BILLED DOWITCHERS were noted at Tobay and the day before 2 SEMIPALMATED PLOVERS joined 2 WILLETS at Jones Beach West End. A pond west of Jones Beach field 10 Thursday contained a few WOOD DUCKS and BLUE-WINGED TEAL and GREEN-WINGED TEAL. A seawatch off Robert Moses State Park Saturday produced 3 RAZORBILLS during a good flight of seabirds which was also noted farther east off Amagansett both Saturday and Sunday with Sundays totals including 48 RAZORBILLS, 112 NORTHERN GANNETS, 43 COMMON LOONS and 94 RED-THROATED LOONS. A CASPIAN TERN at Mecox as of Saturday became 2 on Tuesday and 3 LESSER BLACK-BACKED GULLS were at Mecox on Saturday and 1 Sunday with 1 also lingering at Napeague. Two GREAT CORMORANTS and several hundred COMMON EIDER were still at Shinnecock Inlet Sunday. Eighteen WILSON'S SNIPE were flushed by a NORTHERN HARRIER at Wainscot Sunday and a BALD EAGLE visited Long Pond in Sag Harbor Tuesday and Wednesday. A great flight of BROAD-WINGED HAWKS passed through the area last Saturday with 80 noted over Central Park and over 150 passing by the Greenwich Audubon Center hawk site. Spring is also a time for baby bunnies. 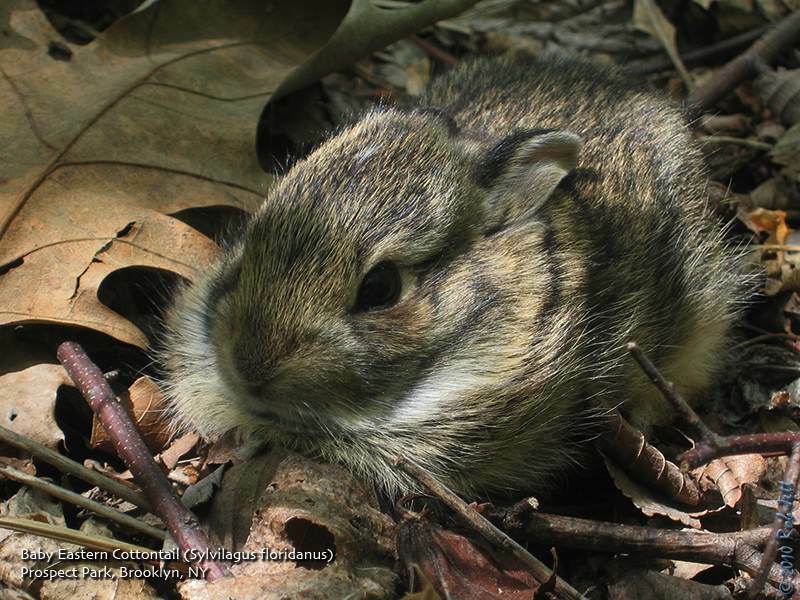 I spotted this 2-3 week old Eastern Cottontail hiding motionless in the leaf litter near Rick's Place. Let's hope Prospect Park's rabbits doesn't suffer the same fate as Central Park's. The weather for Saturday's trip in Prospect Park started off cool and foggy, but we still managed to observe some interesting birds, some of which were recently arrived Spring migrants. I was optimistic that some new birds had dropped in overnight because on my walk to meet the group at Grand Army Plaza I heard or saw Ruby-crowned Kinglet, Pine Warbler, Palm Warbler and Eastern Towhee. I suppose an ambivalent weather forecast scared some folks into sleeping in as only 4 people showed up for my tour. The 5 of us ended up seeing some really good birds. The morning began in the relative quiet at the Vale of Cashmere. A lone Ruby-crowned Kinglet sang his sweet, chattering song in a Black Cherry tree above our heads. A few minutes later, a Winter Wren began to serenade us from within a tangle of underbrush near the top of the ridge. We never did see that tiny wren with the big sound, but were satisfied just having been able to share his song. The morning was colder than expected and we headed for the shelter of Sullivan Hill's woodlands when it started to shower. Thankfully, the rain didn't last very long, but identifying birds in the treetops against a white, overcast sky was, at times, exasperating. As we moved south through the park's wooded areas, the slow song of a Blue-headed Vireo drew my attention towards Payne Hill. On the hillside overlooking the Long Meadow, there was a small mixed flock of birds feeding within some oak trees. 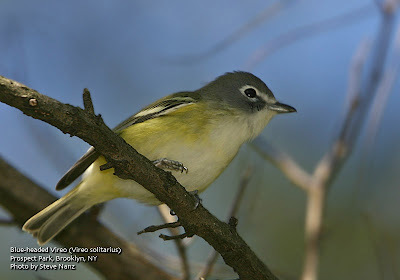 What at first seemed to be a single Blue-headed Vireo turned out to be several. They were the first of the year for most of us. Overnight South winds are the ideal conditions when looking for arriving Spring migrants. Friday night it was coming out of the east, so I didn't expect a fallout of birds. By late in the morning, however, the wind shifted to the south and we did see some interesting flyovers. The first was a Great Blue Heron, followed by a pair of Great Egrets. A high flying Common Loon was seen over the north end of the park with a second, lower bird near the Terrace Bridge. When we were scanning Prospect Lake a flock of 30 Double-crested Cormorants seemed to be considering dropping in, but instead ended up continuing north. Tree Swallows we moving through the area by mid-morning and I wanted to head down to Prospect Lake to look for other swallows. Mixed swallow flocks are common around the lake during migration and it wouldn't be unusual to see three or four different species at once. Once at the lake we spotted a couple of dozen swallows skimming back and forth, snatching up insects low above the water. The majority were Tree Swallows with a smaller number of Barn Swallows. We quickly spotted several Northern Rough-winged Swallows in the mix. There are two "brown" swallows that are fairly common around our area - Bank Swallow and Northern Rough-winged Swallow. Both birds are mainly just brown on the upper surface of their body and white on the underside. The bank has a dark brown band across its chest, whereas the northern rough-winged has a very pale brown throat. My friend Peter likes to say that the rough-winged looks like it has "a 5 o'clock shadow". Picking out swallow species from a fast moving flock requires patience. I tell beginner birders that if they want to learn how to use binoculars, find a flock of swallows and try to identify all the different species. If they don't get dizzy and fall over, they'll become proficient at aiming their bins in no time. 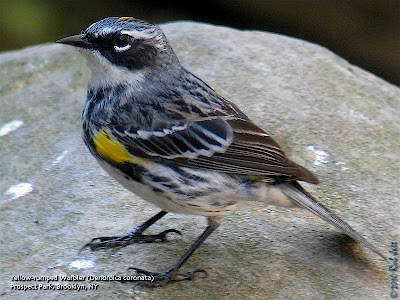 In the wooded areas at the south end of Prospect Park (Peninsula woods and Lookout Hill) we discovered that flocks of Yellow-rumped Warblers had moved into the area. Up to that point I had seen a few of these common wood-warblers, but on Saturday it was clear that large numbers were beginning to flood through the city. Within the next couple of weeks you'll be certain to hear many birders say, after bringing their bins up to their eyes, "Just another yellow-rump". Over the past week more butterflies have begun to appear around New York City. 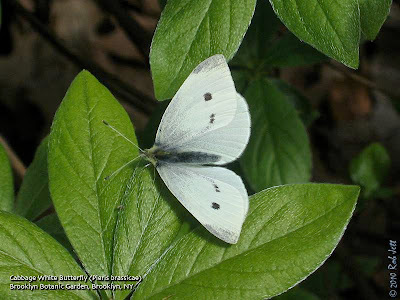 The most numerous, so far, has been Cabbage Whites. These European natives were introduced to Canada and have become naturalized in much of North America. Also seen this week was my first Question Mark of the season. A very ragged individual was circling and landing on a Hackberry tree in Prospect Park. The wings were so beat up that I couldn't be certain of the identification until I examined the photos on my computer. Double-crested Cormorant (30, flying over Prospect Lake. This week the New York Times published an interesting story about how some songbirds change their songs over time. Songbirds are not born with songs in their heads, but learn them from others. And as in a game of telephone, it would seem natural that, over generations, the songs might change. That is what happens with many species, some more dramatically than others. The songs of indigo buntings change so much, for example, that songs that are five years apart are almost completely different. But with other species, the songs are more stable. Now, thanks to some old audio recordings, researchers have determined just how stable some songbirds’ songs can be. 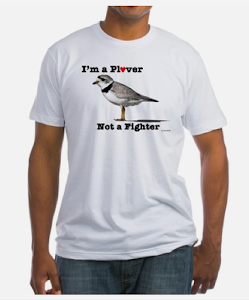 The songbird in question is not just any old bird, but a member of a famous group of finches that Charles Darwin studied in the Galápagos Islands. Using recordings of Geospiza fortis, the medium ground finch, made 38 years apart, Jeffrey Podos of the University of Massachusetts and Eben Goodale, who is now at the University of California, San Diego, found that some songs have persisted over four decades. The researchers conducted a statistical analysis of songs, using elements like number of notes, note duration and trill rate. As they report in Biology Letters, in each year’s recordings there is a lot of variability in the songs. But from one period to another, there are some songs that match quite closely. 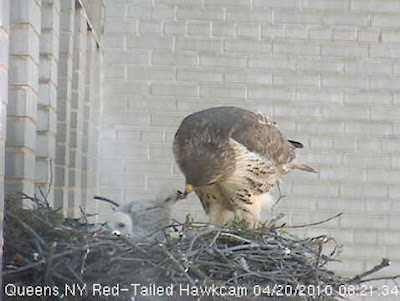 Jeff Kollbrunner's Red-tailed Hawk webcam in Queens is up and running. The veteran parents are currently feeding three hatchlings at their nest. Nearest subway lines: Check www.hopstop.com for subway directions from your location. Meet 10am at the Jamaica Bay Refuge visitor center for a slide program and hike to look for warblers and wildflowers. Leaders: Andrew Baksh, Don Riepe. Call (718) 318-9344; E-mail: Driepe [AT] nyc.rr.com. Welcome spring migration with this series of trips to NYC's best birding hot spots: Central Park, Prospect Park, and Jamaica Bay NWR. All are recognized by National Audubon as Important Bird Areas (or IBAs), and all are beautiful, accessible by public transportation, and full of birds. The varied habitats of these destinations will provide opportunities to see a great variety of songbirds, shorebirds, raptors, and waterfowl. Come see the best nature the city has to offer! Limited to 20. Do you ever wonder who is singing? 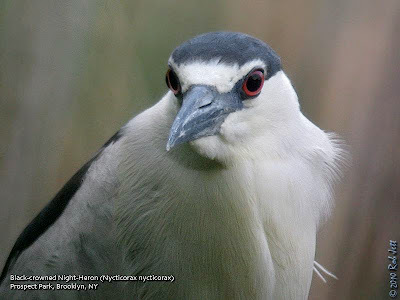 Learn to identify the large variety of migrant and resident birds in New York City. Limited to 15. Greetings. This is the New York Rare Bird Alert for Friday, April 16th, at 6:00 pm. The highlights of today's tape are YELLOW-HEADED BLACKBIRD, PROTHONOTARY WARBLER, HUDSONIAN GODWIT, UPLAND SANDPIPER, HARLEQUIN DUCK, and GLAUCOUS GULL. Ah, the doldrums. Each year at this time, the improving weather, even if in spurts, holds out hopes of increasing numbers of migrants that usually produce less than we anticipate, leaving birders wanting more. And they WILL come! One surprise this week was a male YELLOW-HEADED BLACKBIRD photographed late last Monday afternoon at Mount Loretto Park. This park is off Hylan Boulevard on southern Staten Island, but we are not aware of any additional sightings. Also on Staten Island, three PECTORAL SANDPIPERS were with other shorebirds on the Goethals Bridge pond last Saturday. Other passerines arriving across this area have featured some BLUE-GRAY GNATCATCHERS, PINE WARBLERS, PALM WARBLERS, LOUISIANA WATERTHRUSHES, RUBY-CROWNED KINGLETS, BROWN THRASHERS, HERMIT THRUSHES, WINTER WRENS, and other such species expected in mid-April, plus, as usual, were a small number of WHITE-EYED VIREOS and BLUE-HEADED VIREOS. An ORANGE-CROWNED WARBLER was seen in the Bronx Botanical Garden on Saturday. Another lingering ORANGE-CROWNED WARBLER in Prospect Park was seen again today on the east side of the Lullwater between Terrace Bridge and Boathouse Bridge. And Central Park has added a few new arrivals during the week, with BALTIMORE ORIOLE on Monday, WORM-EATING WARBLER Thursday, and INDIGO BUNTING today, with a couple of EASTERN KINGBIRDS and CHIMNEY SWIFTS also seen. 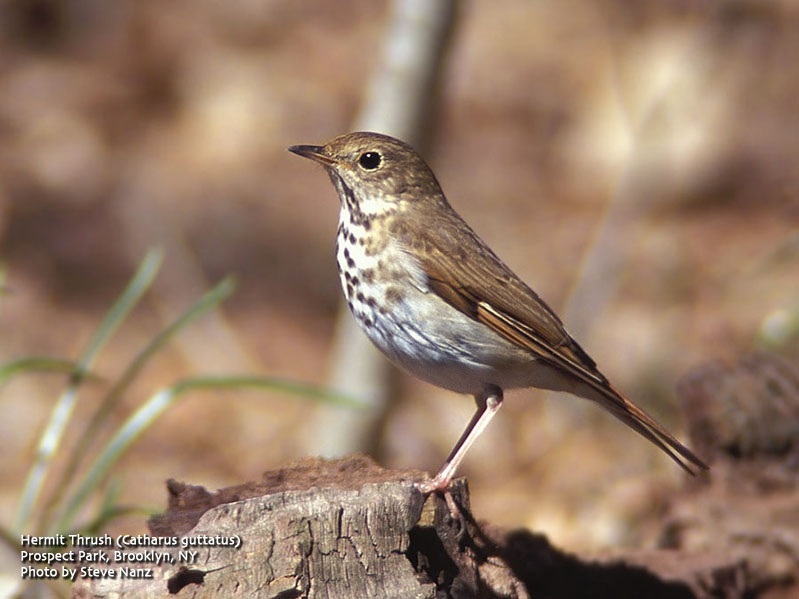 LOUISIANA WATERTHRUSHES were on territory in Sterling Forest north of the city as of last Sunday. Unexpected at Jamaica Wildlife Refuge was a GREAT HORNED OWL in the North Garden last Sunday, whereas waterbirds arriving on schedule have included TRICOLORED HERON, LITTLE BLUE HERON, GLOSSY IBIS, and FORSTER'S TERN. And good numbers of HORNED GREBES, many in full breeding plumage, were still in the Bay south of the West Pond on Wednesday. Good numbers of NORTHERN GANNETS continue to move along the south shore of Long Island, as evidenced by the 1600 around Breezy Point and moving into New York Bay on Wednesday, and an estimated 2200 between Breezy Point and Coney Island today. Seven HARLEQUIN DUCKS were still around the jetty at Jones Beach West End on Thursday, and the UPLAND SANDPIPER continued near parking field 5 at Robert Moses State Park on Fire Island at least to Sunday. Out East, on the North Fork a GLAUCOUS GULL was spotted at Breakwater Beach in Mattituck on Saturday, and on the South Fork an immature BALD EAGLE and a PURPLE MARTIN appeared at Long Pond in Sag Harbor on Sunday. 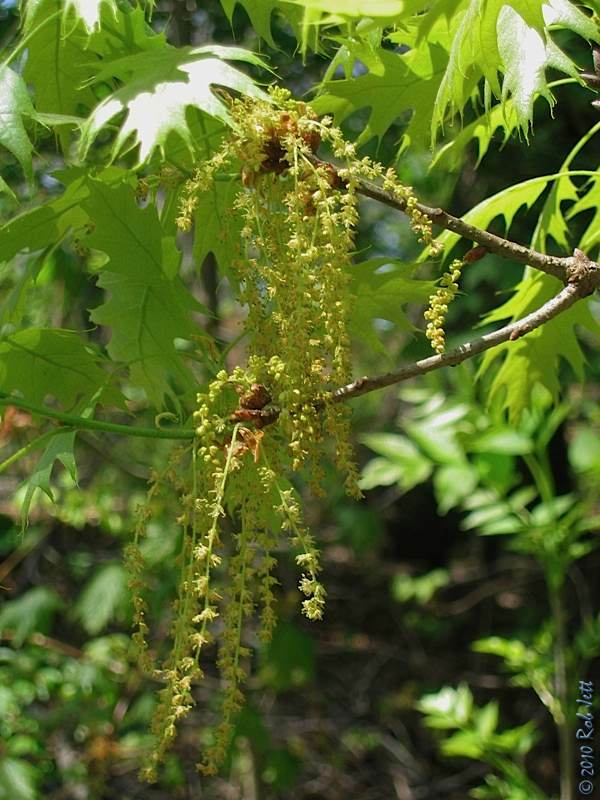 The early blooming trees, such as elms, maples and boxelders, have begun fruiting and are peppering the earth with their green and red keys. In only a week dozens more species of plants have flowered and several new species of migrant songbirds are appearing around the city. One of the most noticeably change are the yellow, dangling catkins adorning all the different species of oaks. These clusters of tiny flowers are attracting swarms of insects which, in turn, will feed flocks of hungry wood-warblers and other neotropic songbirds. Most of these birds are just passing through on their way to breeding grounds in North America's boreal forests, but some will stay and nest in our local parks. Other trees and shrubs that have exploded with blossoms are bitter orange, cherries, crabapples, hawthorns, jetbead, magnolias and redbuds. Some of the notable wildflowers brightening the landscape are daffodils, dandelions, grape hyacinth, red columbine and virginia bluebell. 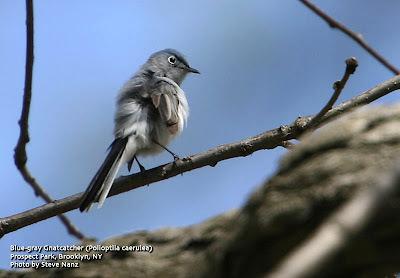 Last weekend I spotted my first Blue-gray Gnatcatchers of the season. As usual, I heard the lisping, wheezy calls of this tiny, hyperactive songbird long before I actually saw him foraging in a tree. 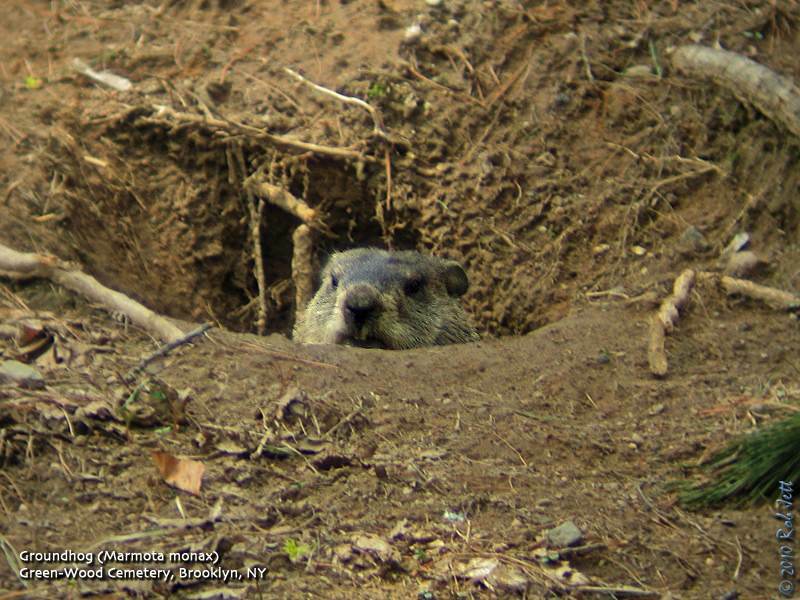 In one morning I observed 4 of them along the edges of Prospect Park's waterways. Last year there was a pair nesting in a locust tree next to Nellie and Max's nest tree at Nellie's Lawn. 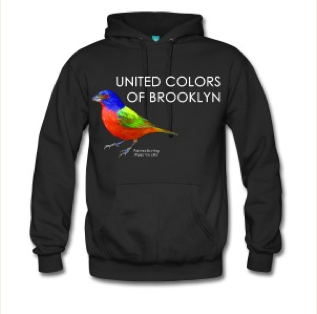 Hopefully, some of these gray songbirds will attempt to nest in Brooklyn this year. 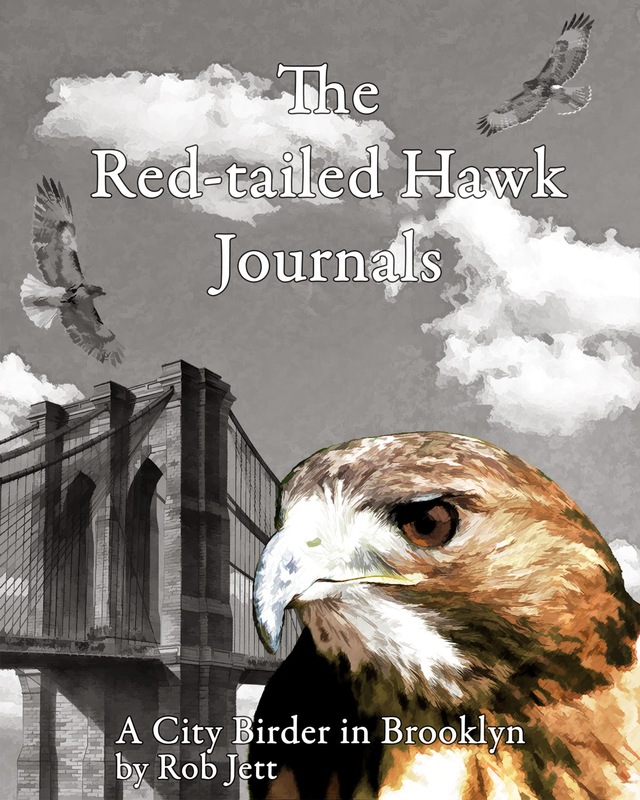 I'd love to get a photograph of a gnatcatcher harassing a Red-tailed Hawk. The size comparison would be funny as the Blue-gray Gnatcatcher probably weighs as much as one of the hawk's toes. Another species to suddenly appear around the city parks is the Hermit Thrush. Unlike their cousin, the American Robin, which can be found foraging nearly anywhere, these thrushes are seen almost exclusively in wooded habitats. Listen for their beautiful song in the early morning and late afternoon. Several years ago I participated in a montane breeding bird survey in the Catskill mountains. One bird that we heard all the time was the Hermit Thrush. They would begin singing at around 4am and could still be heard after sunset, until around 8pm. Two other notable species arrivals list week were Chipping Sparrow and Winter Wren, the latter of which has been serenading people with its explosive song in the morning at Prospect Park's Vale of Cashmere. 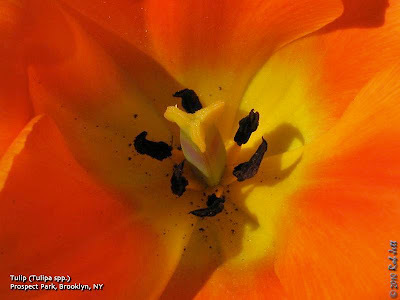 Here's a slideshow of some of this week's blooms. Nothing says "Spring" like gardens carpeted with rows of dazzling, multi-colored tulips. During another era, however, speculating on these coveted flowers was also a means to great wealth. Hike the trails and beach at New York's best kept natural secret -- Dead Horse Bay, along the edge of Jamaica Bay. Join naturalist Mickey Maxwell Cohen, author of Exploring the Trails of Dead Horse Bay and discover little known woodlands, coastal thickets, and a treasure-laden beach. Wear sensible footwear; no sandals. Meet at 2 PM at the main entrance parking lot at Floyd Bennett Field. Meet on the east side of City Hall Park near the Brooklyn Bridge on-ramp. The peregrine falcon is a bird of myth and legend. This charismatic animal is the fastest flyer in the world. Incredibly, New York City now boasts the world’s highest population densities of this formerly endangered species; roughly 15 pairs nest on buildings and bridges around the city. We will learn more about this species as we visit some of their favorite haunts, and may even glimpse them on the nest. Limited to 15. Meet at Grand Army Plaza at the corner of the park nearest the Brooklyn Library. Prospect Park is one of the most important places for migratory birds in New York City. The park’s varied landscapes provide habitat for multiple species. Shoot spring songbirds and learn insect macro photography, using conservation friendly field photography techniques. Bring your digital camera and long and short lens if you have one. 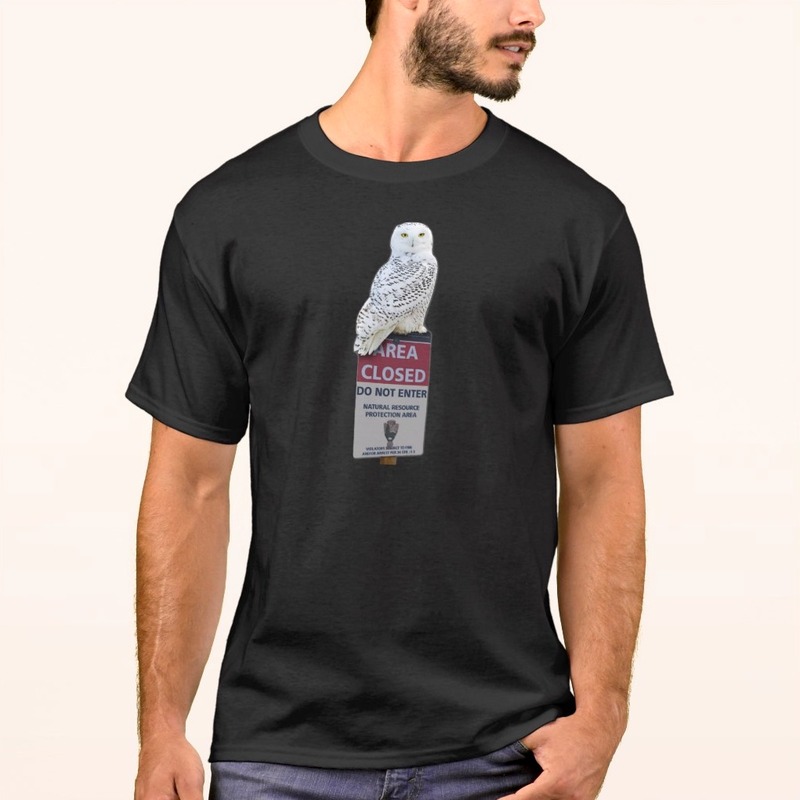 Limited to 8. Saturday, April 17, 9 a.m. to 11 a.m.
Join naturalist and educator Howie Fischer to search out the early spring birds that frequent the parks woodlands this time of year. Listen to the early sounds of spring as migrant birds begin to sing for mates. If the weather conditions and wind direction blow in our favor, we may be able to identify some singing warblers, thrushes, sapsuckers, flickers, sparrows and other migratory specialties that are likely in mid-spring. Saturday, April 17, 10 a.m. to 2 p.m. Enter Great Kills Park by the Buffalo Road entrance from Hylan Boulevard and meet in the 2nd Buffalo Road parking lot (across from the ranger station). From there we will go to the wildflower plot at the Education Center to prepare for this year’s planting. Protectors will supply gloves and tools (& refreshments). After a two hour work session (our 166th consecutive monthly workshop), we will take a short walk over nearby trails. If there is demand we will walk to Crooke’s Point and return. Sunday, April 18, 12 noon to 2 p.m.
We will walk the beach area looking for plants and animals. We might see some migrating ducks, geese and hawks. Bring water and dress for the weather. Meet at the new parking lot next to the picnic area and ranger station. Go to the end of New Dorp Lane and make a left into the park. Drive on the main road toward the administration building. We will meet in the new parking lot beside the building. Speaker: Rafael Guillermo Campos-Ramirez, Caligo Ventures, Inc. Unless another venue is noted, programs are held in the American Museum of Natural History, usually in the Lindner Theater; please enter at West 77th St. between Central Park West and Columbus Avenue. Greetings. This is the New York Rare Bird Alert for Friday, April 9th, at 11:00 pm. The highlights of today's tape are SWALLOW-TAILED KITES, RED PHALAROPE, PROTHONOTARY WARBLER, UPLAND SANDPIPER, fishing trip results, and Spring migrants. It began on Tuesday with a SWALLOW-TAILED KITE passing a hawk watch at Sandy Hook, NJ, the observers following the bird as it headed towards Coney Island. Then on Wednesday a SWALLOW-TAILED KITE was observed soaring over Lake Montauk, eventually moving out of sight. This was followed by one late Thursday afternoon in Westchester County over Pines Bridge Road in the Yorktown/Millwood area. A free doughnut to anyone who finds a New York Swallow-tailed Kite that stays put in the same area for a while! Other good seasonal finds this week have featured a winter-plumaged RED PHALAROPE that appeared at the south end of Sag Pond [aka Sagaponack Pond] at Bridgehampton this afternoon, where other shorebirds included seven GREATER YELLOWLEGS and five LESSER YELLOWLEGS; a PROTHONOTARY WARBLER seen briefly in Northport last Saturday; and an UPLAND SANDPIPER that stayed along the roadway between parking fields 4 and 5 at Robert Moses State Park from Monday to at least Thursday. Also quite notable was the collection of birds seen last Saturday from a fishing boat 28 miles south of Shinnecock Inlet. These included one or two LITTLE GULLS with some BONAPARTE'S GULLS, and a number of alcids including 100 RAZORBILLS, 3 COMMON MURRES, 5+ DOVEKIES, and 25+ ATLANTIC PUFFINS. The previously reported CATTLE EGRET stayed along Route 27 just west of Hither Hills State Park in Montauk to Tuesday, but the SANDHILL CRANES in Bridgehampton were not seen after the 2nd, perhaps being the same two showing up on Block Island in Rhode Island. 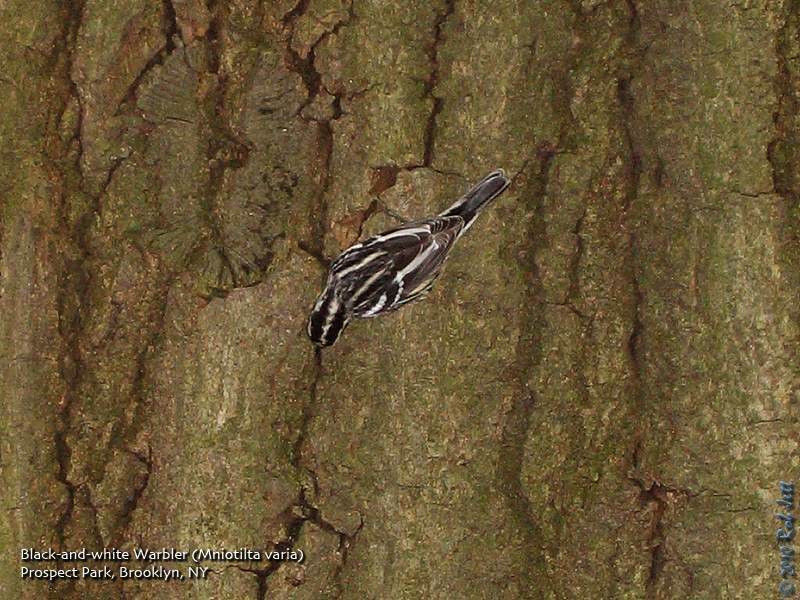 Recent arrivals in the city parks, which effectively serve as our migration barometer, especially for passerines, have included in Central Park: BLUE-HEADED VIREO, WHITE-EYED VIREO, and BLUE-GRAY GNATCATCHER Monday, BLACK-AND-WHITE WARBLER Wednesday, and CHIMNEY SWIFT and an early NORTHERN PARULA Thursday. Prospect Park has had a similar mix, with a GNATCATCHER as of Sunday, three BLUE-WINGED TEAL on the Lake Tuesday, BLACK-AND-WHITE WARBLER at two locations Wednesday, and some flyover GLOSSY IBIS on Wednesday. The Prospect Park ORANGE-CROWNED WARBLER, still by the Lullwater last Saturday, had relocated to the Nethermead Arch Sunday, and has probably moved on. Both parks, like many other sites, have also featured numbers of PINE WARBLERS, PALM WARBLERS, and LOUISIANA WATERTHRUSHES. At Jamaica Bay Wildlife Refuge, arriving waterbirds have included LITTLE BLUE HERON, TRICOLORED HERON, GREEN HERON, GLOSSY IBIS, LEAST SANDPIPER, LAUGHING GULL, as well as some FORSTER'S TERNS as of Monday. FORSTER'S were also noted at Jones Beach West End Tuesday. A LESSER BLACK-BACKED GULL was also at Jones Beach West End Thursday, and among the many Northern Gannets, loons, and sea ducks moving along the south shore of Long Island lately were two RED-NECKED GREBES off Robert Moses State Park on Tuesday. Back out East, an ICELAND GULL joined six PIPING PLOVERS at Mecox Sunday, while Sag Pond that day produced both Yellowlegs, LEAST SANDPIPER, one ICELAND GULL, two LESSER BLACK-BACKED GULLS, and a BOAT-TAILED GRACKLE. Four BLUE-WINGED TEAL were at Hook Pond in East Hampton Tuesday, and two HARLEQUIN DUCKS were still at Montauk Point last Sunday. This was one of two groundhogs I encountered in Green-Wood Cemetery this week who were uncharacteristically active during the early afternoon. It's not too late to start listening to your bird song CDs. The climax of the Spring songbird migration is about a month away and I have some recommendations for preparing your ears. When I hear a Blackburnian Warbler's high-pitched song resonating through the forest canopy, I can actually see its fiery orange throat and facial pattern in my mind. By knowing the songs and calls within a woodland filled with hundreds of singing birds, a structured, organized image of the surrounding creatures emerges out what, to the uninitiated, may be perceived as random, chaotic noise. The morning chorus on a May morning can be appreciated by just sitting with one's eyes closed and listening. Barring any severe hearing disorder, anyone can learn to recognize the songs and calls of their neighborhood birds. The best tool available, in my opinion, is the Peterson Field Guide Series "Birding By Ear".